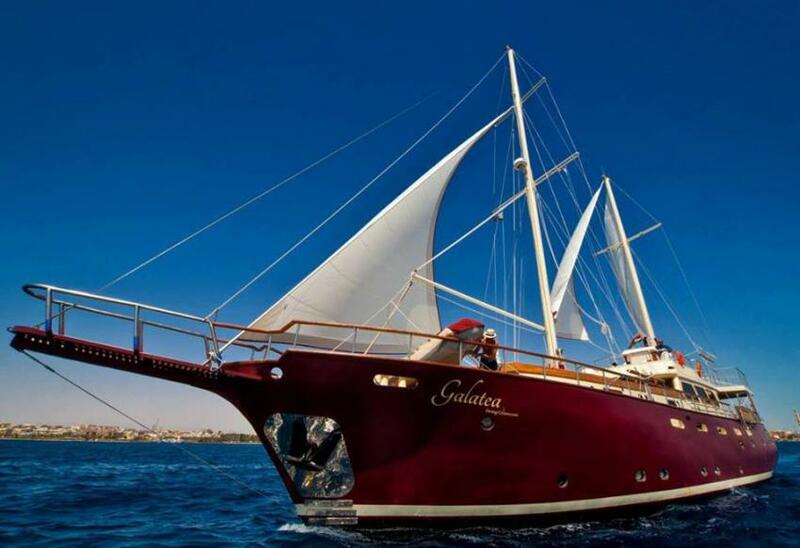 Galatea was originally built as Turkish schooner, in 2013 she was rebuilt to suit divers needs. There are three types of accommodation on board of Galatea. Divers can choose to stay at the double cabin. They are placed on the lower deck, equipped with air-conditioning and private facilities. Also, there are two double cabins on the after deck. This bow staterooms are slightly smaller. On the main deck, there are two master cabins, it is more spacious and has a separate bathroom. Galatea Liveaboard is not a very big boat, it can welcome only 12 passengers, what makes her cozy. Boats guests can spend time in the lounge area or in the open air dining zone. Plus there is a shaded upper deck space, where passengers can enjoy the view or warm sun rays. On the dive deck of Galatea, there is a full set of equipment that can be rented. To get to the dive sites boat use two tenders. Galatea equipped with all that necessary to ensure safety on board: smoke detectors,fire extinguishers, emergency rafts, first aid and oxygen kit, also there is a defibrillator on board. Diving is not the only thing that you can do during the trip. Non-diving passengers can do snorkeling in crystal clear waters or, fishing or kayaking. Certified divers also, don't have to spend all vacation under the water Galatea can be great for you. The trip programme includes also beach activities, visiting of La Digue Island. Galatea offers 7 and 3 nights itineraries that include diving at a fascinating dive spots of Seychelles. Divers can visit Shark Bank, that is famous for the big variety of tropical reef fish, opportunity of meeting grey stingrays, white tip reef sharks, schools of barracuda. Grey reef sharks can be also spotted near the Marianne island. Diving along the vertical walls and at the drop off is possible at the Ave Maria dive site. But not only diving can be interesting for a passenger of Galatea. The trip can also include and activities, snorkeling, and kayaking. The warm climate of Seychelles makes diving here possible all year round like the other activities as well. Best time to visit its destinations is in the calm periods which are April through May and October through November. The whale shark and Manta rays watching season are between August and October.